The East Village Association has worked diligently with Ald. Manuel Flores over the past six years. A wide variety of issues has faced the 1st Ward before Gov. Pat Quinn in January appointed Flores to chair the Illinois Commerce Commission. Some initiatives have succeeded: establishment of the East Village Landmark District, contentious within EVA through years of downzoning and land-use debates; downzoning of Leona’s restaurant location at 1936 W. Augusta Blvd. ; preservation of buildings at 1916-24 W. Chicago Ave., and steering Walgreens away from the Polish Triangle. Some have failed: demolition of two "orange rated" buildings and loss of the historic Com Ed substation on Division Street. And many more remain incomplete: transit oriented development at the Polish Triangle and inclusion of EVA in the sidewalk café permit process. We expressed our continued support for an appropriate development on the former Pizza Hut property at the southwest corner of Division and Ashland. The economy has delayed the dense, mixed-use, transit-oriented development we had hoped for and Walgreens' developer has listed the property for sale. However, waiting for the right development, rather than acquiescing to inappropriate development plans, was the right thing to do. A highly profitable automobile-oriented business such as a Walgreens could potentially tie up that corner with the wrong use for decades. We emphasized that waiting a few years for the right development will pay dividends to the community in perpetuity. At the November 2009 EVA meeting, Alderman Flores agreed to our longstanding request that the "Pedestrian Street" designation, which currently runs on Division from Leavitt to Marshfield, be extended to Ashland. This special designation within the zoning ordinance is intended to enhance and preserve the pedestrian character of community shopping districts like the one on Division Street. The designation prohibits curb cuts across sidewalks, and requires storefronts to have display windows of a minimum size. At our meeting we followed up on this commitment and were disappointed to learn that nothing had happened yet. Since the necessary ordinance had not yet been written, we asked the alderman to consider extending the designation on Division Street all the way to Milwaukee Avenue. This would complement the existing Pedestrian Street designation on the Milwaukee Avenue side of the Polish Triangle and signal a commitment to improving conditions surrounding the Polish Triangle. We noted that the former Washington Mutual property on the Polish Triangle recently had been rezoned from B2-2 to C2-1 and asked the alderman how this happened. The zoning change apparently took place without notification of the East Village Association, as has been the custom when zoning changes have been requested within the organization’s boundaries (per the EVA bylaws: Damen, Division, Milwaukee and Chicago). The C2-1 zoning classification allows a multitude of uses that are incompatible with the historic character of the Polish Triangle and its status as a major public transit-oriented urban corner. Although the recently rezoned parcel is small, the new zoning now is contiguous to the used-car lot to the south and represents a significant threat of inappropriate auto-oriented development. We discussed apparent efforts to consolidate property at Chicago & Ashland and shared our concern that once consolidated, the buildings would likely be demolished. The block includes several architecturally significant buildings. Their loss would undermine the historic character of the Chicago Avenue commercial district and set back efforts to revitalize the street’s community-focused retail character. Although, like Division Street, the adjacent portion of Chicago Avenue is protected by the Pedestrian Street designation, the Ashland frontage could provide the necessary access for an auto-oriented franchise or strip mall. As in the case of the Polish Triangle, such low-density automobile-focused development is inappropriate on an important urban corner well served by public transit. We asked Alderman Flores to look into the matter. We discussed the existing perpendicular parking in front of L. Miller & Son Lumber Co., 1815 W. Division. The parking is in direct opposition to the principles of the Pedestrian Street designation. This highly irregular parking arrangement currently serves a business that many of us support and is undeniably an integral part of our community’s history. However, the recent listing of the Miller Lumber property for sale raises the issue of whether it is appropriate for the parking situation to remain after Miller Lumber leaves. Without addressing that question, we requested the alderman simply make it clear to all parties involved (Miller Lumber, its real estate broker and potential developers) that the property does not come with any rights to parking in the public way, and that restoration of the parkway and streetscape is a possibility. In recognition of the long-discussed possible relocation of the 13th District police station from Wood Street, we reiterated our longstanding position that the city-owned land be reserved for community use. Wood Street is the main residential artery of East Village. If the next alderman shares Flores' interest in the green economy, he or she would do well to copy its success as a green corridor. There are three community gardens between Division and Augusta: Frankie Machine, Greenhouse Garden and the newly established Near North Montessori Farm. Converting the police property to a similar use would extend this green corridor south of Augusta. East Village’s grassroots emphasis on urban food production, combined with an ever-growing interest in parkway beautification (lead by Jeanne Felknor) is solidifying our reputation as a sustainable urban community. Using the Wood Street Police property to support additional community-based agricultural efforts is the next logical step. Possible uses include establishment of an additional community garden, or alternatively a community farm, where residents work collectively to produce a marketable crop (as opposed to produce for their personal consumption). Another possibility would be to use the facility to support experimentation in community-based composting, hydroponic gardening or even locally based alternative energy production. These are just a few of the issues that are of concern to East Village residents. Establishing a relationship between a community organization and an alderman is a long and difficult process. It has required the building of trust, establishment of lines of communication, the transfer of decades of institutional memory and has taken an investment of significant time and effort on the part of EVA officers, board members and volunteers. 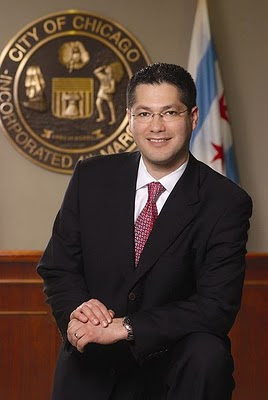 Alderman Flores’ resignation puts all of it at risk. Alderman Flores has suggested several possible successors, including his chief of staff, Raymond Valadez. If the mayor were to select from list, it would be reasonable to expect some consistency in policies from the new alderman. However, the obvious advantages of running as an incumbent present a real temptation to the powers that be. Regardless of how one feels about the legacy of Alderman Flores, he was elected by a majority of ward residents. This will not be the case for his immediate successor. On evachicago discussion board: Flores has ideas on who should replace him, but will Daley listen?